Once again, as if we were a real commercial enterprise, (Cyber Wednesday Evening!) we’re reducing DVD prices for the holiday season, price for the Deluxe is now $19 and for the original $15. Click Here To Order These prices will only be in effect for a few weeks, so if you’ve been procrastinating about ordering for yourself or as a gift, now’s the time to act! And as announced last year, but in case you missed it, the film is now available for streaming and download via Vimeo. Here’s the link. Sorry, but since the prices are so low can’t reduce further for the holidays. And remember by ordering the DVD or something else you’re helping to support truly independent film. Thanks! Film now Available to Stream and Download! Well, finally! Big news, the film is now available for streaming and download on Vimeo, something a lot of people have asked for over the last couple of years. If you are one of those people hope you’ll order and also spread the word! 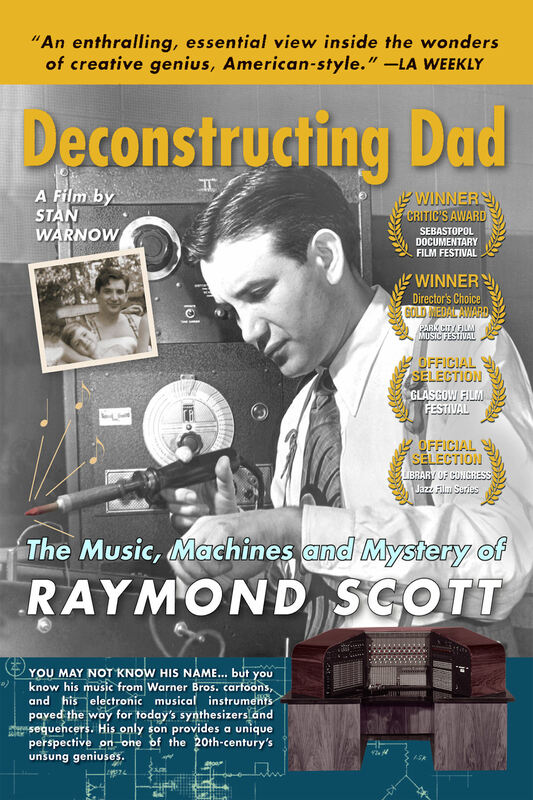 Wanted to wait till September 10th so it could be part of the Raymond Scott birthday celebration, but some other plans prevent that, so we’re starting the celebration a bit early . Here’s a link to the order page on Vimeo .https://vimeo.com/ondemand/deconstructingdad. Followers of this site are sure to notice there haven’t been many events and posts lately (but of course the DVD is still available). Once in awhile, though, an event comes-up, and this Monday promises to be very special. Through the efforts of legendary Mac guru David Biedny, who teaches in the Design Department at the Yale School of Drama, the film will be shown this Monday, April 6th, at 4:30pm, on the Yale campus — full address is 212 York Street, Room #106, New Haven, CT. I will attend, answer questions, and discuss the film (and whatever else comes up, and I expect it to be a lively discussion) afterwards. It’s a free event that’s open to the public, so if you’re in that area, hope to see you there! Huge thanks to David Biedny, and fellow Yale professor David Budries, for making this happen. I’m very excited to be showing the film at Yale! They Call it Cyber Monday–Reduced Holiday DVD Prices! OK, this doesn’t really have anything to do with cyber Monday or the great T-Bone Walker song, but the phrase just popped into my head as I began writing this realizing that coincidentally it was coming out on “Cyber Monday.” But it is a holiday bargain–once again we’re reducing DVD prices for the holiday season, $5 off both the Deluxe and Original DVD’s. So the base price for the Deluxe is now $20 and for the original price is $15. Click Here To Order These prices will only be in effect for a few weeks, so if you’ve been procrastinating about ordering for yourself or as a gift, now’s the time to act! And remember by ordering the DVD or something else you’re helping to support truly independent film! Thanks…….